George Papp Superboy #85 "Impossible Mission" Abraham Lincoln Assassination/Time-Travel Story Final Page 7 Original Art (DC, 1960). Before there was Stephen King's novel 11/22/63, there was Jerry Siegel's "The Impossible Mission." This Silver Age classic features Superboy as he travels to the past to prevent the assassination of Abraham Lincoln -- but along the way, he runs afoul of the adult Lex Luthor who immobilizes the Boy of Steel with red Kryptonite. To his credit, Luthor suffers tremendous guilt over the tragic result. 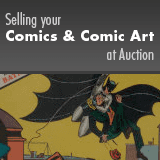 This ultra-famous page has an image area 13" x 18", and the art is in Excellent condition.